“PSTEC Positive Secrets” is a Must! This is the tutorial almost EVERYONE’s been asking for, and finally it’s here! In “PSTEC Positive Secrets”, Tim lifts the lid on what PSTEC Positive can really do and he’s going to show you how. 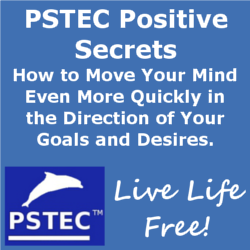 Learn how to use PSTEC Positive to make your goals, targets, dreams and desires a reality. This package uncovers exactly what you’ve wanted to know, and how to get great results fast with PSTEC Positive. Confusion over emotions and beliefs? This will tutorial make it very easy for you. You’ll never wonder again. Did you know there are three types of belief that relate to emotion? Tim will show you what they are and why it’s vital to know the difference between them. Even users and therapists of other modalities because there is information on beliefs and language that will prove to be very, very useful. Make PSTEC Positive work for you. This package will quickly turn you into an expert with PSTEC Positive. Take your skills in using PSTEC to another level. This means when you want to listen you can listen. When you want to read you can read. More choice. More information. More success. EVERYTHING you wanted to know about PSTEC Positive but were afraid to ask!!! !